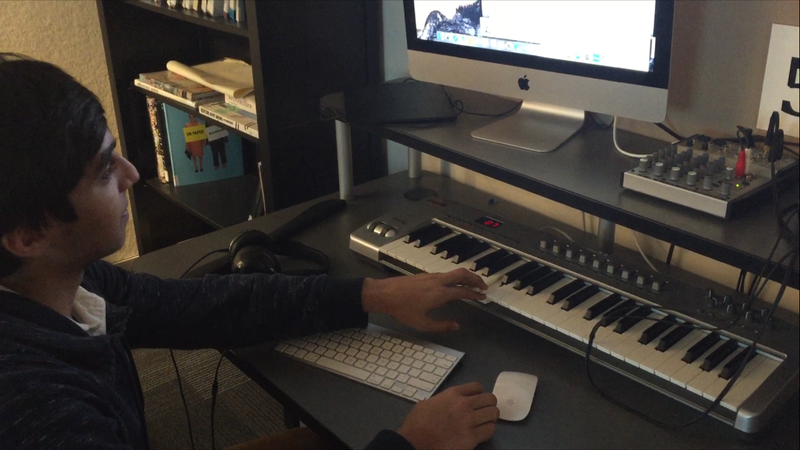 Students watched online tutorials on Pure Data and by the end of the class were able to create a simple sequencer that ported MIDI data to a DAW like GarageBand, AU Lab, or Ableton Live. We began work using simple oscillator constructs such as [osc~] and [phasor~] to build Amplitude Modulation synths. At first, we simply used sliders to adjust pitch and volume. By the end of the class, many students were using the [notein] object to receive signals from MIDI keyboards. In addition to this, using the [line~] object, we were able to use the velocity messages from the MIDI keyboards to trigger both an on and off command for our synths. Very exciting! On Wednesday we took a look at two tasks. What is Frequency Modulation and how to create an FM synthesizer using two distinct oscillators. We also created a fully functioning ADSR envelope so that students could achieve more nuanced control of their sound by having a sharp attack as well as having a long release, or vice versa. Karan had fun using the [random] object to add an aleatoric element to his patch. Every element that could be altered was controlled at random using the [metro] object to change each event every second. It sounded crazy but cool at the same time! On Thursday we took a look at the [poly] object and the [pack] object which allows us to separate a stack of notes, sending them to a number of different oscillators. These two objects in conjunction allow users to create polyphonic synthesizer, or synths that can play multiple notes simultaneously. Prior to today, all of our synth patches have been monophonic. We also listened to music of Kraftwerk and Karlheinz Stockhausen. Towards the end of class we all played our synthesizers together in a huge melange of different colors, textures and patterns. Taking a step back from Pure Data, we discussed the VST and AU plugin "Crystal." We learned how to create our own patches using a commercially available synth. In order to run "Crystal," we ran everything through our DAW of choice, Ableton Live. We talked about using an Amplitude Envelope, how to use an LFO, and how to use the Modulation matrixes in "Crystal" to produce complex, evolving sounds.